An alarm indicates that the Challenger system has detected a problem, for example if a door is opened when its area is armed. Alarm: For an input in alarm, the RAS’s area LED flashes(except where an area LED has been assigned by the installer to indicate some other condition), and the top line of the LCD screen is blank. See “Alarms” below. The alarm signal (siren, flashing light, etc.) and the circumstances that cause it depend on the Challenger system programming. When an alarm is generated there can be a number of inputs in alarm simultaneously. It’s important to know which inputs are causing the alarm in order to deal with them. Inputs are identifiedby a number in the range 1 to 1008, and a name programmed by the installer. When there is an alarm, the corresponding area LED on the RAS flashes red and the LCD screen displays the following. Press [NEXT] or [*] to update the list of inputs and display the next inputs in the list (if any).Note: Inputs in alarm are displayed with an A in front of the number.Inputs in tamper are displayed with a T in front of the number. An authorised user typically must enter a code at the keypad to reset (acknowledge) an alarm. Arm or disarm the area. Enter your code and then press [ENTER]. If the alarm conditions are no longer valid (false alarm), and the alarm has been reset, it is important that you contact your alarm monitoring company to ensure that no further action is taken by them. Note: Individual RASs may be programmed to enable authorised users to reset alarms without a code. In such cases, the reset key sequence is [ENTER] [ENTER]  [ENTER]. A local alarm is one which occurs when an area is occupied (disarmed) and is therefore transmitted only within the building and not relayed to an alarm monitoring company(for example, a fire door has been opened during working hours). The alarm input may be programmed as a silent local alarm (input types 21 and 42). For silent local alarms “Local Alarm” is not displayed on the RAS and the beeper does not sound. When resealed, the reset key sequence is nnnn (where nnnn is your code) [OFF]  [ENTER]. Press [ENTER] [ENTER] to see which inputs are in alarm. Press [NEXT] or [*] to update the list of inputs and display the next inputs in the list (if any). There may be more than one input in alarm, and if you reset without checking you might not know about the additional inputs. Correct the condition that caused the local alarm (for example, close the fire door) before the local alarm reminder time expires, or the input will re-alarm. If your system has been programmed with a reminder on local alarms, it will re-alarm after a pre-set time unless the cause has been fixed. System alarms indicate that a Challenger device (control panel, DGP, or RAS) has been tampered with, has stopped communicating, or has detected a fault condition such as mains fail, low battery, fuse fail, and so on. Your Challenger system may be programmed so that system alarms automatically reset and generate restoral messages when the alarm condition is no longer present. For example, a mains fail alarm is cancelled when power is restored. Alternatively, your Challenger system may be programmed so that system alarms latch. This means that a system alarm does not automatically reset, and a valid code (that is authorised to reset system alarms) must be entered. If you are unable to reset a system alarm because the conditions require a service technician to attend, you may need to isolate the RAS or DGP. Quick alarm history is a simple way to determine the location of the input that caused an alarm. This information may be necessary where you have to reset an alarm without first checking the cause. To display the quick alarm history, there must be no active alarms. The LCD screen must show the default message on the top line and the word “Code” on the bottom line. Press [ENTER] [ENTER] to display the quick alarm history, displayed in chronological order from most recent. The time the alarm occurred as hour and minutes (HH:MM). The date the alarm occurred as day and month (DD:MM). The input number and name of the alarm. Press [ENTER] to display earlier alarms. Press [NEXT] to display later alarms. Press  to shift the text displayed on the top line to reveal any additional characters. Press  to exit quick alarm history. Note: The area listed is a guide only. If the input in alarm is associated with multiple areas, then only the first (lowest numbered) area is reported. You may need to arm your Challenger system in order to activate intrusion detection when you leave the premises. Once you have armed the system, you must leave the area within a preset exit time to avoid setting off the alarm. Only the areas controlled by the RAS can be armed from that RAS. Alarm system control for areas is determined by the RAS’s alarm group. Only the areas controlled by your user record can be armed. Alarm system control for areas is determined by your alarm group. Inputs in the areas you need to arm may first need to be sealed (for example, the contacts for all doors and windows must be closed), depending on how your alarm group is programmed. If at any time during the arming process the RAS sounds seven quick beeps and displays the word “unsealed”, you will need to seal or isolate the input. Press nnnn (where nnnn is your code) , and then press [ENTER] or [ON]. Any disarmed areas that are assigned to your alarm group are listed.Press [*] to see more areas, if applicable. Press  [ENTER] to arm all disarmed areas. The corresponding RAS area LEDs illuminate. Alternatively, enter one of the displayed area numbers, and then press [ENTER] to arm only that area. Repeat as needed to arm additional areas. The corresponding RAS area LEDs illuminate. When finished arming areas, press [CLEAR] or [MENU*] to exit the display. To arm all unarmed areas that are assigned to your alarm group, press nnnn (where nnnn is your code) , and then press [ENTER] or [ON]. The corresponding RAS area LEDs illuminate. You must disarm your Challenger system in order to deactivate intrusion detection so that you can enter the premises without setting off the alarm. If you enter before disarming, you typically have a preset entry time to avoid setting off the alarm. The RAS’s area LEDs illuminate to indicate which areas are armed. Only the areas controlled by the RAS can be disarmed from that RAS. Alarm system control for areas is determined by the RAS’s alarm group. Only the areas controlled by your user record can be disarmed. Alarm system control for areas is determined by your alarm group. Inputs in the areas you need to disarm may first need to be sealed (for example, the contacts for all doors and windows must be closed), depending on how your alarm group is programmed. If at any time during the disarming process the RAS sounds seven quick beeps and displays the word “unsealed”, you will need to seal or isolate the input (see “Isolating inputs”). The arming procedure will vary depending on whether your assigned alarm group has been programmed to display a list of areas. Press nnnn (where nnnn is your code), and then press [OFF]. Any armed areas that are assigned to your alarm group are listed. Press  [ENTER]to disarm all areas. The corresponding RAS area LEDs extinguish. Alternatively, enter one of the displayed area numbers, and then press [ENTER] to disarm only that area. Repeat as needed to disarm additional areas. The corresponding RAS area LEDs extinguish. When finished disarming areas, press [CLEAR] or [MENU*] to exit the display. To disarm all areas that are assigned to your alarm group, press nnnn (where nnnn is your code), and then press [OFF]. The corresponding RAS area LEDs extinguish. Access testing is typically used for inputs that you need to test as soon as the area is disarmed. For example, to enable you to test a hold-up button immediately after disarming the area. The areas that contain the inputs to be tested must be assigned as vaults. Automatically rearm an area (delayed by the user category time) that you’ve disarmed so that you don’t need to remember to arm it. Automatically arm an area (delayed by the user category time) in response to another area being armed (this is referred to a vault programming). A user category is programmed with a name to identify the purpose (for example, ‘Guard’). When auser category is in effect (the user category timer is running), the LCD screen displays the user category name.Certain areas (and user records) may be configured for timed disarming, where you don’t need to remember to rearm the area when you leave because it automatically rearms after a specified interval. When user categories are used and areas are programmed for timed disarm, a warning will sound (if a warning time is programmed) indicating the areas are about to alarm. During the warning time the LCD screen displays ‘ending’. Enter your code to reset the delayed arming timer. An unsealed input (such as an open door or window contact) can prevent an area from being armed or disarmed, depending on how your Challenger system is programmed. If any input is unsealed when you try to arm or disarm an area, the RAS may sound seven quick beeps and identify the unsealed inputs on the LCD screen. Press [NEXT] or [*] to display additional unsealed input numbers, if any. The input’s name is displayed if the system option Display One Input at a Time is enabled. Alternatively, press the number for any unsealed input, and then press [ENTER] to see the number and name. Press [ENTER] to exit the display. After you have determined which inputs are unsealed, you must seal them (for example, close the door), and try again to arm or disarm the Challenger system. Your system might be configured to use keypad duress, which allows you to signal a duress condition (for example, a holdup) by entering a special duress code on a keypad instead of your alarm code or door code. Reports a (silent) duress alarm to the alarm monitoring company. Displays the characters “…,” on the LCD screen. The special duress code is the user’s alarm code +1 (last digit only). For example, if your alarm code is 8914 then the duress code is 8915. If your alarm code is 8919, then the duress code is 8910 because only the last digit is affected. To reset (cancel) the duress alarm, enter your usual alarm code. The “…” characterswill be removed from the LCD screen. Note: If duress was activated under conditions which are no longer valid (false alarm), and it has been reset, it is important that you contact your alarm monitoring company to ensure that no further action is taken by them. You may need to isolate an input to prevent false alarms (possibly due to a faulty input device). Isolating the input excludes it from functioning as part of the intrusion detection system. If an input is in an alarm state, then isolating it resets the alarm. After the problem is resolved the input must be de-isolated (see “De-isolating inputs”). A faulty input is typically unsealed, and cannot be sealed. From the user menu prompt, use the following steps to isolate an input. Press [ENTER]. The LCD screen displays the first unsealed input or the message “All Inputs are Sealed”. Enter the number of an input, and then press [ENTER] to isolate that input. Press [*] to display additional unsealed inputs (if any), and then isolate them if required. When finished, press [ENTER] to exit this menu option. An input may have been isolated to prevent false alarms (possibly due to a faulty input device). Isolating the input excludes it from functioning as part of the intrusion detection system (see “Isolating inputs”). After the problem is resolved the input must be de-isolated. Note: Do not de-isolate the input before checking the circumstances, because de-isolating an unsealed input may cause an alarm. From the user menu prompt, use the following steps to de-isolate an input. Press [ENTER]. The LCD screen displays a list of isolated inputs or the message “All Inputs are De-Isolated”. Isolated inputs that are unsealed are indicated with a ‘u’ in front of the input number. Press the number of an isolated input and then press [ENTER] to deisolate that input. Press [*] to display additional isolated inputs (if any), and then deisolate them if required. 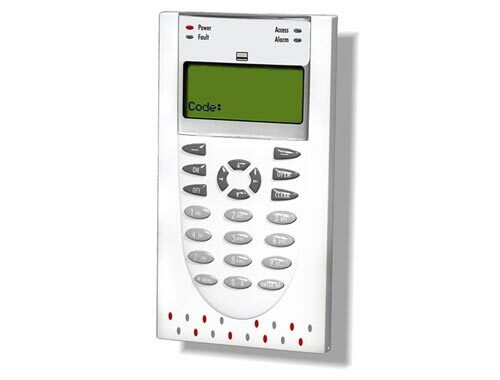 A RAS with a keypad and liquid crystal display (LCD) screen enables authorised users to enter a series of numbers called a “code”, in order to access the Challenger’s menus, which are displayed on the LCD screen. A device such as a Smart Card Reader is typically used for access control such as for opening doors. However, your Challenger system may be programmed to also use cards for alarm control, where an authorised user can disarm their assigned areas by presenting their card to a reader. The Challenger system can also be programmed to enable an authorised user to arm their assigned areas by presenting their card three times within a few seconds. RASs typically have one or more red light-emitting diodes (LEDs) to indicate whether their assigned areas are armed (LED on), disarmed (LED off), or in alarm state (LED flashing). Note: When an area LED on a door’s RAS is lit, the area is armed. Do not open the door unless you can disarm the area or you may trigger an alarm. Your Challenger system may be programmed to shunt (ignore) certain inputs when a door is opened in order to allow temporary access when armed. Consult your installation company if in doubt. A RAS with an LCD screen enables authorised users to use the Challenger system’s menus, and displays messages about alarms or unsealed inputs that may prevent an area from being armed. A short beep indicates that a valid card is presented at a reader or a key is pressed on a keypad. The beep may be followed by two beeps to indicate that access has been granted (for example, toopen a door). Seven short beeps indicates that a code or card is not valid at the particular RAS or at the particular time, or that the area you are attempting to arm has an input that is unsealed or in alarm. A continuous tone indicates that an input test is being performed. Continuous beeping indicates that one or more inputs are in local alarm, or the area is about to be armed. Your Challenger system may be programmed so that the RAS beeps whilst an entry timer, exit timer, or warning timer is running. A RAS’s LCD screen displays messages about the state of the Challenger system and to help navigate the menu options (subject to permissions). The display might also show information you have entered on the keypad. The welcome screen indicates that the Challenger system is ready to receive commands. The top line is a configurable message, such as the default time and date, or other text such as the company name. Note: Images of LCD screens used in this manual are for illustration only and may not match actual RAS LCD screens. A blank top line indicates that an alarm has been generated by one or more inputs. “Local Alarm” indicates that one or more local alarms are active (see “Local alarms” in Alarm Memory section). The bottom line displays “Code” to indicate that the Challenger system is ready to accept a user’s personal identification number (PIN), also called a code. Scrolling. Also called rotation, scrolling displays the text in a scrolling ‘banner’ style. Scanning. You may see a “1-Scan” option displayed on the bottom line. Press the  key to shift the text to the left. The bottom line of the LCD screen contains instructions and indicates the characters you enter on the keypad (except for codes, which are shown as ‘*’ characters). The Challenger system’s user menu has 23 top-level options for use by authorised users, administrators, or installers (see Table 1 below). A menu option will be visible to you only if allowed by the alarm group assigned to you and to the alarm group assigned to the particular RAS that you are using. Refer to a copy of the Challenger 10 Administrators Manual for details about options that are not explained in this guide. Use the following steps to access the menu when the “Code” prompt is displayed on the bottom line of the LCD screen. In the following example, the system is configured to display the time and date instead of the default message “There Are No Alarms In This Area”. 2. Press nnnn (where nnnn is your code),and then press [ENTER] to display the user menu prompt. 3. From the user menu prompt, you can now select the menu option you need, or press  [ENTER] to exit. Alternatively, press [ENTER] (or the RAS’s down button, if applicable) to view the available user menu options in sequence. 4. When finished, press  [ENTER] to exit the menu. Note: After a few minutes of inaction, the Challenger system automatically exits the menu and return to the “Code” prompt. We recommend that you press  [ENTER] to exit the menu to prevent unauthorised use (that would otherwise be logged against your code). Press [ENTER] to scroll forward one menu option. Press [MENU*] to scroll backward one menu option. Press the menu number, and then press [ENTER] to jump directly to a menu. Press  [ENTER] or press [CLEAR] to exit the menu. To program a value, such as a number or amount, enter the value, and then press [ENTER]. The information will be saved and the display will show the next option. To program a YES/NO option, press [ENTER] to accept the display or press [MENU*] to toggle between YES and NO. Press  [ENTER] to skip the options. Inputs are identified by a number and (optionally) a name programmed by the installer. The name is useful to determine the location of an input that is unsealed or in alarm. In this case, enter an input number, and then press [ENTER] to display the input’s name. Areas are identified by a number from 1 to 99 and (optionally) a name programmed by the installer. When arming or disarming the system, you may want to select a specific area instead of selecting all areas. Some RAS models (such as the CA111x series) support area search mode to help you quickly find areas by name. Please refer to the Challenger 10 Administrators Manual for details about this procedure not explained in this guide. Opening a door means to use the Challenger system to unlock the door’s electric locking mechanism so that the door can be opened. You would typically open a local door that you want to pass through (see “Opening a local door” below). In addition, a user (such as a security guard) may need to open a remote door for someone else to pass though (see “Opening a remote door”). A RAS’s keypad may be used to unlock a door by entering a door code or alarm code, as applicable. Alternatively, the door may be equipped with a card reader that performs the same function as entering a code on a keypad (the reader must have the option “Door event flag on alarm codes” enabled). If the entered code is not valid, or if the time zone is not valid (for example, after hours), or if it is not valid at the particular arming station or reader, then the arming station or reader will emit seven quick beeps. The door must be included in the door group assigned to the user in order for the user to be able to open the door. The following instructions are based on the system being ready to accept your door code or alarm code, as shown below (note the word “Code” on the bottom line). Use the following steps to unlock a door and to enter a disarmed area. Press nnnn (where nnnn is your code). Use the following steps to unlock a door and to arm an area (i.e. to exit a room that you want to arm after you leave), assuming that your user record has permission to arm and disarm. Your system may be programmed so that you can enter your code to unlock a door and to enter an armed area without setting off an alarm by suppressing (shunting) the relevant inputs (such as door contacts) for a specified time. In such a case the LCD screen would indicate as follows. If the door is not closed when the warning time starts, the display will show “Suppression Ending”, and the RAS will sound the warning buzzer for a preset time to enable you to close the door, or to re-enter your code to extend the suppression time. The Open Door command would typically be used at a RAS that’s at a different location from the door (for example, from a security desk) otherwise the commands described in “Opening a local door” could be used. From the user menu prompt, use the following steps to open a remote door. Enter the door number,and then press [ENTER]. Alternatively, press [ENTER] to return to the User menu. Tip: Use the Unlock, Lock, Disable and Enable command to unlock a door for an indefinite time. By entering a code on a RAS keypad. By presenting a card or key fob to a reader-equipped RAS. Using a wireless remote device, such as a transmitter, read by appropriate hardware. Allowing appropriate hardware to read biometric factors, such as a fingerprint. In order to operate various parts of the Challenger system, your user record must also have appropriate permissions assigned via “groups” of privileges called alarm groups, door groups, and floor groups. For example, authentication will fail if you do not have access to the particular door at the particular time of day. If authentication fails, the RAS beeps seven times in quick succession. Note: Unless otherwise noted, this manual will use the term “enter your code”, regardless of the type of authentication your Challenger system requires. A single swipe of a card can disarm areas and unlock the door for you to enter. Three swipes of the card can arm areas and unlock the door for you to exit. Only areas that are assigned to both the user and the reader can be armed or disarmed. An alarm code is a personal identification number (PIN) consisting of a series of 4 to 10 digits that uniquely identifies you to the Challenger system. Your Challenger system may be programmed so that you can use your code to arm and disarm the system and to open doors. Alternatively, your system may allow the use of a door code to open doors, and a duress code to send a message to the alarm monitoring company. These terms are explained below. Door code: A door code is a shortened alarm code (but still must be at least four digits). For example, if an alarm code is 123456, and the Challenger system is configured to use two alarm code prefix digits, then the door code is 3456 because the two prefix digits are removed. Duress code: See Duress Code section.